Whiting’s Mobile Articulated Car Jack (MAC Jack) enables wheel or truck change-outs to be performed in as quickly as 20 minutes. 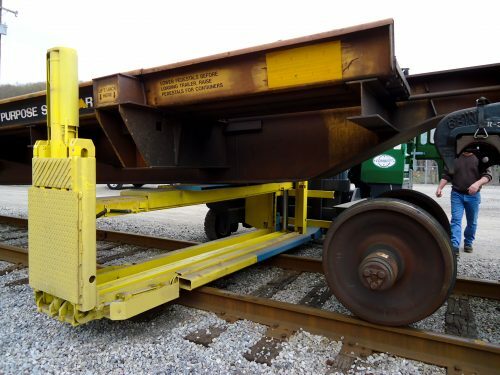 It’s uniquely designed to lift unloaded well and center beam-type articulated railcars over 30 inches above the rails. It can handle railcars in the yard up to 50 tons. The unit requires only a 6” rail clearance without an adapter plate (8 ½” with an adapter plate) between the top of the rails and the bottom of the car. This low profile is made possible because one of its two hydraulic lifting cylinders pivots to a horizontal position for easy under car access. In the unlikely event of hydraulic system failure, a ratchet and pawl system provides a complete mechanical fail-safe condition. The heavy-duty MAC Jack and its companion self-contained power unit is capable of servicing railcars in any location where it is possible to operate a fork truck. This versatility instantly makes your whole yard a repair shop.